Elaine Brent is a long distance triathlete from New Zealand. Originally born in England, she immigrated with her family to NZ at an early age. Before arriving in NZ Elaine had already changed to a vegetarian diet and as her thought patterns progressed, she later became vegan. She became a triathlete in 2009 and after dabbling with different distances, is now aiming at ironman 70.3 world champs 2015 over the next year of racing. I became vegetarian when I was 9 after visiting a fish factory. Then became vegan permanently at around 19 after making the decision based on 4 grounds: 1) general industry cruelty standards that I believe should not be tolerated, 2)the fact that to use strictly only organic/free range dairy/eggs would be too hard for me to do at the moment. 3) the overriding principle that I don’t believe I should take anything from anything without being able to ask it (whenever possible), 4) I have read and listened to many different health arguments and my own conclusion is that I will be healthier without dairy. Benefits include weight loss and elevated energy levels. Becoming vegan was the catalyst for the beginning of really looking after myself. It motivated me to delve in to other aspects of my health and even the smallest changes have led to large changes in my overall wellbeing. For example, having to check ingredients gave me an insight to just how much additives and un-needed ingredients are in food that I presumed only included what the title label suggests. Since being vegan, I have also become gluten free once I found out I was intolerant. I have also cut back on raw cane sugar which has had endless positive impacts on my life. I have cut down alcohol and I am over all happier and appreciative of my life which I take as the best gift I was ever given. Veganism, I think represents strength of mind body and soul. Everything from the way I’ve learnt to react to criticism and standing by my decisions, to becoming the athlete that I am today is owed largely to being vegan. As a triathlete my training is always working towards increasing my swimming, cycling and running abilities - even when stretching and popping out some squats in the gym. I was not from a swimming background so I am currently swimming 7–9 times per week averaging approximately 5km per set (broken into repetitions) to play a “bit” of catch up. I spend the rest of my hours at the gym, running and cycling. I train just over 30 hours per week and have one day off per fortnight. This has been a very gradual increase and I can now balance this healthily whilst working part time. Being vegan definitely carries a huge stereotype and honestly, I can see why. Whenever anything surrounding veganism is brought up, there is usually a voiced opinion from a strongly outspoken vegan, which does not help the cause. Despite that kind of attitude being a minority among vegans, it is the one that is heard and remembered the most. That is why I always try to encourage a more peaceful approach. I believe the biggest influence comes from example rather than accusations and anger. 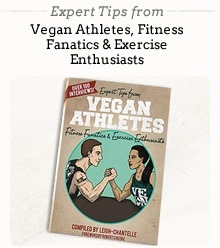 I can’t really answer this one too well as I’ve only ever been a vegan athlete. I can say that I am just as strong as a non-vegan with no restrictions on what my body needs and I suppose I have less chance of food poisoning! Eating abroad and language barriers. I haven’t had any experience of anyone being unsupportive emotionally from either vegans or non-vegans in regards to my racing but I do think omnivore’s struggle to understand where I am getting my nutrients from to support my lifestyle. My immediate family are all vegan or vegetarian and I have some other family members who are also vegetarian. The rest don’t question how I choose to eat and maybe think it’s strange at worst. Response: protein and iron are in almost everything I eat and I couldn’t avoid it if I tried. Understanding that pain and suffering is the same no matter who you are and the fact that pain and suffering need have no part of my diet is what motivates me to be vegan. The adrenaline of competition and the desire to win is what motivates me to train and race. Lunch - Gluten free pasta, rice or potato meal including chickpeas/lentils/beans, tofu etc. and a variety of vegetables. Snack: Gluten free vegan bar or second serve of meal from lunch depending on third training session. Dinner: Protein salad including plenty of vegetables and including beans/lentils/chickpeas/falafel with large sprinkling of ground almond/nuts/chia, sunflower, sesame seeds. Options of dressings include lemon, mustard, olive oil, tamari sauce, vinegar and sweet chilli. I might add a potato if I’ve had a very hard day. Snack: Fruit and of course the occasional dark chocolate or potato chip total cave in. Iron - Spinach or really anything dark green. I have a naturally very high carbohydrate diet which fits well with my training. Apart from the occasional treats, it is all “good” carb though and all contain vital nutrients. My energy is gained from having a mainly carbohydrate diet with the rest made up of fat and protein. The fact that I eat around double the amount of calories someone else my size would eat due to training means my diet is still very high in protein and fat also ensuring my body functions well. I take a women’s multi and chlorella powder mixed in water. Previous to this amount of training, I was on no supplements. Losing weight – 14 hour fast from last meal at night. Cut out unnecessary sugars and processed food whilst watching portion size. Maintaining weight – Just eat more whilst still avoiding unnecessary sugars and processed food. If you want to gain weight, I presume you will want “good” weight, not excess fat. This goes without saying that muscle building is a must. Improving metabolism – All of the above. Toning up – I find this a funny one and I have often pondered it over the years but basically, I believe it’s fat loss. We all have abs under fat but most of us will never show them because you have to be of a very low fat percentage to do so. Depending on your goals, I would be more focused on muscle development (and that doesn’t have to be bulky muscle) whilst maintaining a healthy fat percentage. Muscle helps burn fat but this does not mean if you do some hamstring curls you will dissolve your thigh fat. It will mean however, that you have more muscle working toward burning your overall fat and when you do strip fat, you will have shapely hams waiting. I do remember the best advice I was ever given - in regards to fat loss: As I was sitting on a couch, probably devouring cake, I was doing my daily moan of “poor me, why am I so fat – how am I ever going to get rid of it?” I was confronted with an answer, which was slightly broad but never the less the eye opener to my own self-indulgence and generally slack attitude. The advice was thus: Eat less, exercise more. As is obvious, my top tips weren’t really vegan specific and that’s because I believe you can be fat, thin or a bit of both on any diet. I promote veganism in my daily life by just being vegan. I believe that the fight against animal cruelty needs to be a peaceful and factual one. More aggressive approaches may well have worked for other battles but I have seen too many walls thrown up in defense to think that yelling and screaming my views will make any changes. I have known many people try veganism/vegetarianism and stick with it just because they see that it can work. When questioned I respond as factually and emotionally detached as possible. There has been a long build-up to make vegans appear as losers and emotionally weak individuals in society however slight the insinuations. It’s the same technique used against feminists and environmentalists and so I believe we do need to rise above the immediate impulse to anger when attacked about our beliefs and understand that to become vegan for some people means more than just changing their diet. I’ve noticed that some almost take the act of veganism as an attack on their own character, which I think is one of the many reasons that people are not always welcoming to the idea. It is a very different concept for most to understand and will not be understood overnight. I do believe that changes are happening, especially in the Western world. Veganism is an act of moral standing but also a representation of a concept that can be implemented throughout many other aspects in our world. As a vegan, I am an individual taking my place in large-scale shift of mind-set and I hope this is just the beginning.